Article originally published on Medium at databiosphere.org. One approach is to create a closed, monolithic data platform. This model is conceptually simple and has precedents in the world of technology. But, it’s the wrong answer for the life sciences. Closed systems are contrary to the spirit of the scientific enterprise. And, monolithic systems won’t provide the flexibility to accommodate the wide range of scientific needs and the diverse regulatory requirements of different jurisdictions. Instead, we propose the idea of creating a vibrant ecosystem, which we call the “Data Biosphere.” It contains modular and interoperable components that can be assembled into diverse data environments. In the following we outline how the biomedical community can work together to rapidly achieve this goal. The Data Biosphere should be based on four governing principles. It should be: (1) modular, composed of functional components with well-specified interfaces; (2) community-driven, created by many groups to foster a diversity of ideas; (3) open, developed under open-source licenses that enable extensibility and reuse, with users able to add custom, proprietary modules as needed; and (4) standards-based, consistent with standards developed by coalitions such as the Global Alliance for Genomics and Health (GA4GH). As in biological ecosystems, the health of the Data Biosphere will be measured by both its activity and its diversity. The Data Biosphere will also need to have clear structural principles. We envisage two key aspects: modular components and data environments. The Data Biosphere will work best if it is designed around key modular components — each having discrete capabilities and clear rules of interaction, and each served by multiple alternative implementations. To offer a familiar analogy, modern internet technology is organized around components that play distinct roles, such as web servers, web browsers, search engines, and email clients. For each component, users have multiple choices, which can be mixed and matched. While we take this user experience for granted today, it was directly at odds with the strategy of many groups that sought to build monolithic systems in the early days of the web. We believe the life sciences community should take a similarly modular approach to facilitate diversity and interoperability. While the modular structure will surely evolve over time, it is useful to have a clear starting point. Over the past year, we and others working on various large-scale biomedical projects have therefore engaged in discussions on this topic, including with the leadership of GA4GH at the meeting in May 2017. A proposed initial framework for a Data Biosphere, showing the roles of Biosphere Components, is illustrated in Figure 1. Figure 1. The diagram illustrates a proposed architecture for a Data Biosphere, consisting of (from the bottom up): (i) Data Assets, such as large datasets of genome sequences or images, stored on Clouds that provide low-level services, such as storage, databases, and access control (grey); (ii) Data Access Services, which control access to data services and expose them via standardized APIs to multiple different services created by many groups (blue); (iii) Indexing and Search capabilities to make it easy for researchers to find data and build cohorts (pink); (iv) Workspaces, which are analytical sandboxes where researchers can perform analyses on cuts of data and share them with collaborators (red); (v) Analytical engines, which allow users to deploy workflows and perform exploratory analyses (green); (vi) Repositories for sharing workflows and notebooks (orange); and (vii) Specialized Portals and user interfaces to support ad-hoc use cases and leverage the underlying services (yellow and peach). The Biosphere Components are the critical building blocks, but they are not alone enough to meet the needs of the biomedical community. Most users will not be able to assemble these pieces of code into production-grade functioning services. The community will therefore also need Data Environments. By a Data Environment, we mean a suite of services, assembled from the Components, that allow users to carry out a set of related tasks in an easy way. To create and manage Data Environments, operational skills are required. Data Environments have the responsibility of securing datasets, so that they can only be accessed by appropriate researchers. They must make it easy for researchers and their funders to pay for the cloud compute and storage costs used. They should provide intuitive interfaces, as well as training and support. We envision multiple Data Environments, targeting a diversity of communities, use cases, and data types. Figure 2. 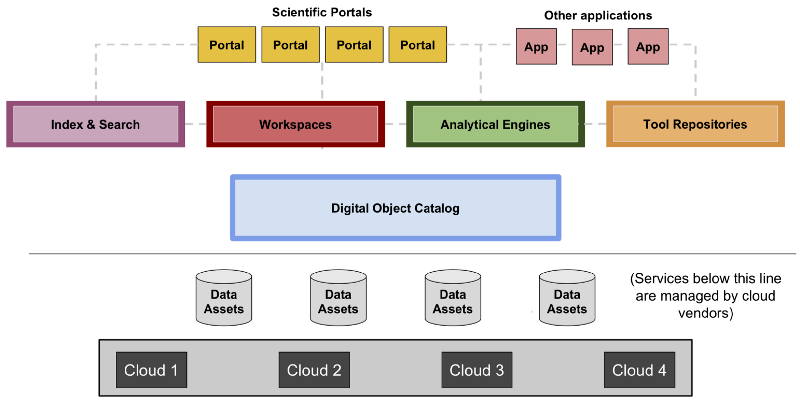 The diagram illustrates the role of Data Environments: (i) data assets are stored on one or more clouds; (ii) Data Environments are stood up and operated to enable researchers to access and analyze these data assets; (iii) each Data Environment assembles Components that meet the needs of its community of researchers. A given data asset can be accessed by multiple Environments (as represented in by data asset A in this Figure), and a given Environment can access multiple assets (as represented by Data Environment #3 in this Figure). Over the past year, the biomedical community has already begun the work of creating a Data Biosphere. We, along with many others, are contributing to the GA4GH definitions of standard interfaces and are actively developing multiple open-source components that fit in the framework in Figure 1. Moreover, there are several projects underway to create Data Environments for different purposes — including (1) the NIH All of Us Research Program, which will recruit roughly 1 million participants from across the US and provide secure access to their genomic and clinical data for health research; (2) the National Cancer Institute’s Genome Data Commons, which is charged with aggregating and harmonizing major cancer genomics projects in the US; and (3) the Human Cell Atlas’s Data Coordination Platform, an international effort organized by the scientific community to aggregate data from experiments aimed at comprehensively characterizing human cell types and states. Discussions are also underway about creating additional Data Environments to serve different needs. 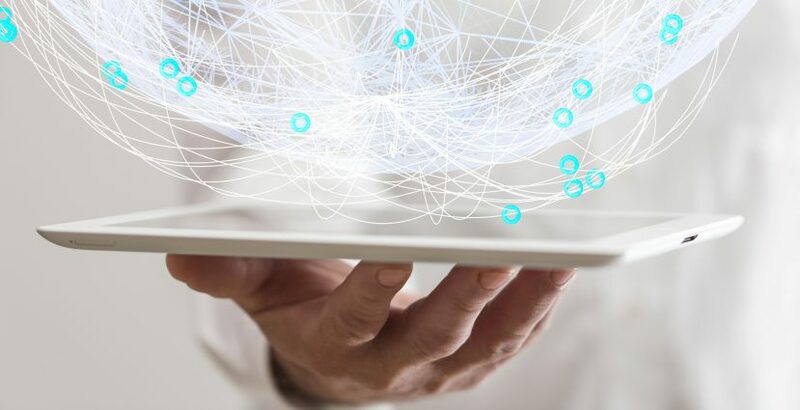 Building a Data Biosphere to propel progress in biomedicine will require a community working together, including laboratory groups generating data, software developers creating Biosphere Components, and technical teams assembling and operating Data Environments. The vision described here will surely evolve with experience, but the fundamental principles provide a solid foundation for using information to improve human health. Together with the global community, we will make the vision real.